Research suggests that up to 80% of acute low back pain is a result of injury to the lumbar discs and physiotherapy treatment has been shown to be effective in the management of lumbar disc injuries. It is important to treat correctly to maximise patient outcomes and attempt to prevent recurrence of the injury. Lifting, bending, putting on shoes – often there is a minor incident with minimal discomfort at the time. The following morning the patient “can’t get out of bed”. 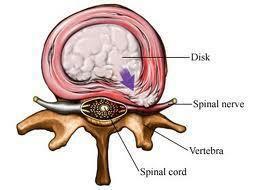 Occasionally there is a major disc injury with immediate onset of pain and disability. If there are obvious neurological signs (loss of power or reflexes), specialist review is recommended as soon as possible. The patient may present with central, bilateral or unilateral pain, but only about 20% will have leg pain. The patient reports stiffness of the back in the morning, difficulty getting in/out of the car and difficulty with standing from sitting, and may have a slight list (stand crookedly) or a loss of lordosis (flat back). AGGRAVATION – Sitting, bending activities, coughing/sneezing, standing from sitting. EASING – Lying down, walking and changing positions. PALPATION – Often there are no palpation signs but there may be obvious muscle spasm. Physiotherapy treatment may include the McKenzie treatment protocol, lumbar rotations, neural mobilising techniques and patient education and home exercises. Retraining of the lumbar spine stabilising muscles has been shown to significantly decrease the chances of recurrence of low back injury (Hides J, Jull G and Richardson, C. (2001) Long-term effects of specific stabilizing exercises for first-episode low back pain. Spine, 11, 243-248.). This 3-year follow-up study demonstrated that for patients who had suffered first episode LBP, all of whom were pain free within 3 weeks, the patients who were rehabilitated with specific stabilising muscle retraining by a physiotherapist had a 50% less chance of re-injury than those who had been treated medically over that time period. Local hands on therapy commenced as soon as possible can usually improve signs and symptoms very quickly following a low back disc injury.